3.Be careful of the seawater/swimming pool chlorinating corrosion and avoid long-time hyperthermal exposure under the car windshield. Carfia sunglasses are fashionable, versatile, and make the perfect companion for everyday driving. --These sunglasses provide great polarization without over darkening. Polarized Lenses are engineered to cut 99% of glare from paths and pavement. Harsh rays of light won't distract you, and with the improved depth perception of enhanced visual contrast, you'll spot loose gravel and sand, small cracks, potholes and even slick areas that can be danger zones. Full rim frame made from corrosion resistant metal, ergonomically construction make it feels sturdy and comfortable. --Solid Flexible hinges fit different faces shape nicely even you have a big head, Steel frame ( Impact and scratch resistance) of metallic quality luster which makes them brighter and more impressing. Featuring square shaped lenses for a universally flattering look, clean, conservative yet unique design. 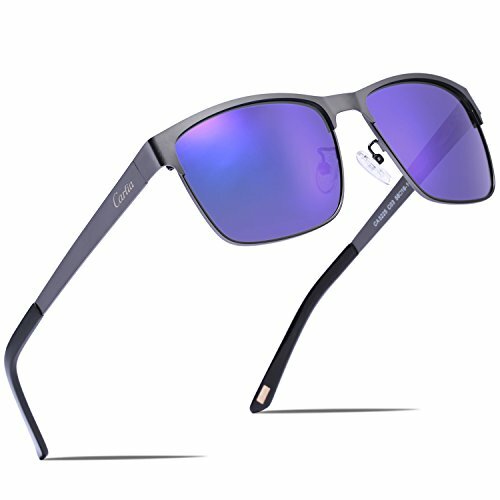 These sunglasses have spring hinge to maintain their initial balance, well packaged comes with Carfia cleaning cloth and protective carrying case when not in use. --If you want a premium feeling pair of sunglasses without the premium price, we can't recommend these enough. Mens design with Carfia logo displayed on temples, available in a wide range of lens colors to suit your lifestyle. --OUR PROMISE: 365 days warranty on frame & lenses (even with only a little scratch on lens) full refund or a free replacement, whichever you prefer!! !✔✔✔ Click the Product Page Logo of "MAYBE TRADE CO.,LTD" and contact Carfia service team, we'll be always there for you. How should I care for sunglasses? --Be careful of the seawater/swimming pool chlorinating corrosion and avoid long-time hyperthermal exposure under the car windshield. They work great only under the sunlight!